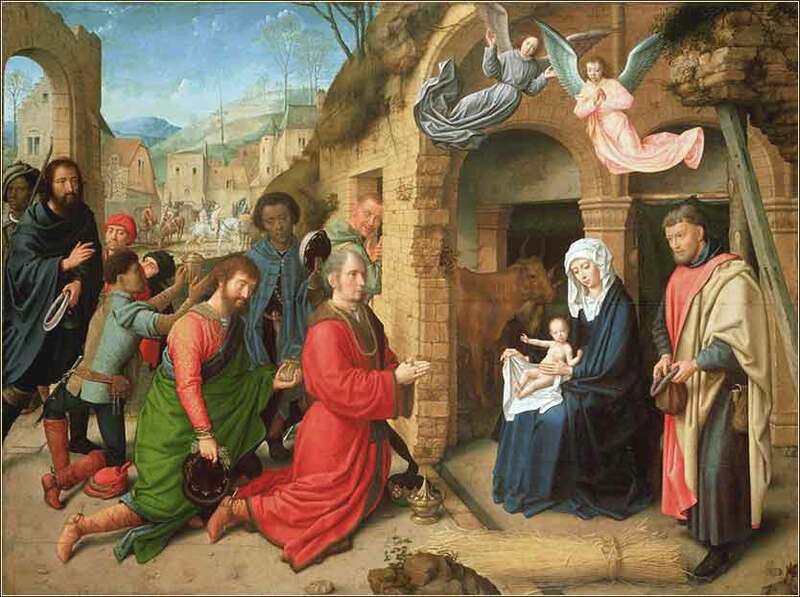 Adoration of the Magi, Gerard David, c. 1495. And going into the house they saw the child with Mary his mother, and they fell down and worshiped him. Then, opening their treasures, they offered him gifts, gold and frankincense and myrrh. And being warned in a dream not to return to Herod, they departed to their own country by another way. The story of the wise men is one of the most wonderful stories in the Bible. It has given rise to great research, speculation, and embellishment by later scholars. If you read the Bible, you will notice that nothing tells us how many there were, whether they each brought a single gift, or any indication of who they were, much less their names, races, or an indication that they were "kings". The biggest hint is that they are called "magi", which at that time was specifically used for a group of star-watchers — astrologers or astronomers — in Persia. This fits in well with the Biblical information, because some of the Persian magi were wealthy, Persia is east of Israel, and astronomers would be so likely to notice and travel towards a new star. Moreover, followers of Zoroaster were monotheistic and their beliefs were much less contentious than most religions; Zoroastrianism is al much a philosophy as a religion. Wise men could easily have studied and known the works of Hebrew prophets (in this case, Micah). They certainly credited the baby Jesus as a holy person, for they brought Him gifts and worshipped Him. The implications of their journey are great, for they anticipate the salvation that Christ brings, not only to Jews, but to all the world. Having met and worshipped Christ, they departed "by another way". Of course, there is a literal meaning for this, since they do not want to encounter King Herod. But there is a symbolic meaning, also, for like all the world, the birth of Christ set them on a different spiritual path as well as a different physical path.